Cast: Paul Walker, Bruce Greenwood, Moon Bloodgood, Jason Biggs. Well that wasn't what I was expecting. What looked like it was going to be an ice-bound action adventure turned out to be a Disney huskies-against-the-elements sugarthon. And not a very good one at that. It's the Paul Walker factor that threw me. From The Fast and the Furious to Into the Blue, having Paul Walker on the cast list is usually a guarantee of a mindless but pretty evening - and that still applies here, though in a slightly different way. 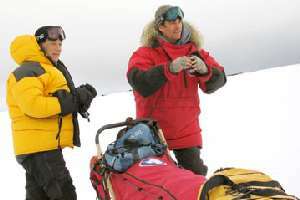 Walker is an Antarctic guide to a band of scientists, his forte being the band of huskies that pull his sled, bearing stark and clearly intentional similarities to Santa's reindeer. When things go pear-shaped and a huge storm comes in, our blue-eyed hero is forced to leave his canine collection behind and is unable to return to them. Oh dearie dear, how tragic and strangely unmoving. From here on, we get plenty of footage of the dogs fending for themselves, which is quite good fun, interspersed with Walker's struggle to get back to Antarctica, which isn't. Never work with animals, they'll only show you up. The human actors were always going to be up against it in this story, and they do little to steal the stage. Jason Biggs, the American Pie pudding f*cker, tries hard as the obligatory geeky assistant but can't do much with the uninspired script, while Bruce Greenwood and Moon Bloodgood could have been replaced by anyone without the audience noticing. The dogs are the stars, but even they can't sustain the overlong running time - by the 90 minute mark there are no ideas left to exploit, yet for some reason the movie plods on and on, robbing the inevitable climax of its poignance because the viewer stopped caring twenty minutes earlier. 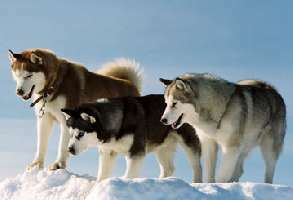 Eight Below is an adequate Disney movie for the kids and soppy dog-lovers to enjoy, but there's nothing that hasn't been done better a zillion times before, so you should consider it only as a fallback movie in case your first choice is sold out. To enjoy this film you should be: a Disnophile or doggie devotee. Eight Below was released in the UK on 21st April.